I had skipped the previous two issues of DC SUPER-STARS–#10 I passed up after being challenged by the owner of the short-lived candy store in which I found it, and #9 had contained only a single Superman story backed up by other war, western and science fiction tales focusing on firearms–not enough to make me part with my money. There had been ads for this special magic-themed issue running, but I don’t think I paid them much heed. But I do remember seeing this Halloween beauty at the 7-11 and snatching it up, largely because it contained a classic Flash reprint. But it must be said, this Gray Morrow cover is one of the most attractive of its era. The lead feature was a compilation of a series of back-up features which had run in ADVENTURE COMICS a few years earlier, starring Zatanna. I was well aware of who Zatanna was at this point, so this interested me. And the artwork by Gray Morrow was simultaneously strange and realistic and also attractive. 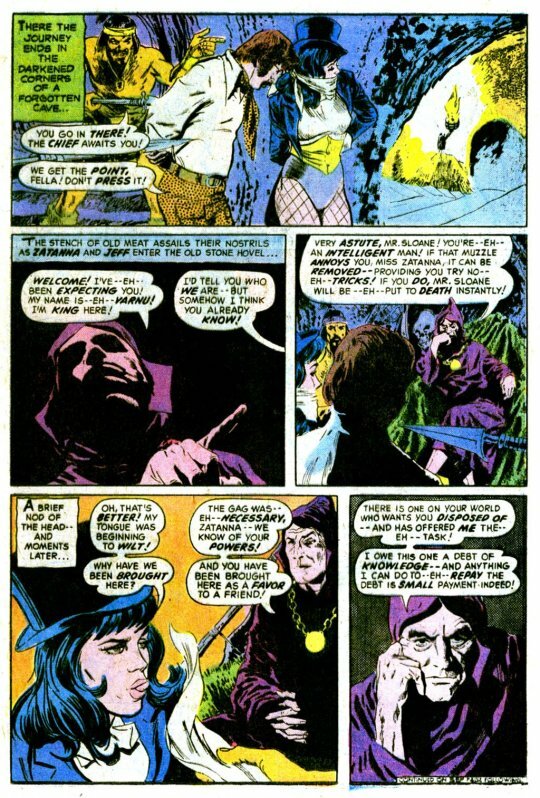 Writer Len Wein’s story was more of a supernatural saga than a super hero adventure, but told in such a way that I could make the leap and enjoy it. 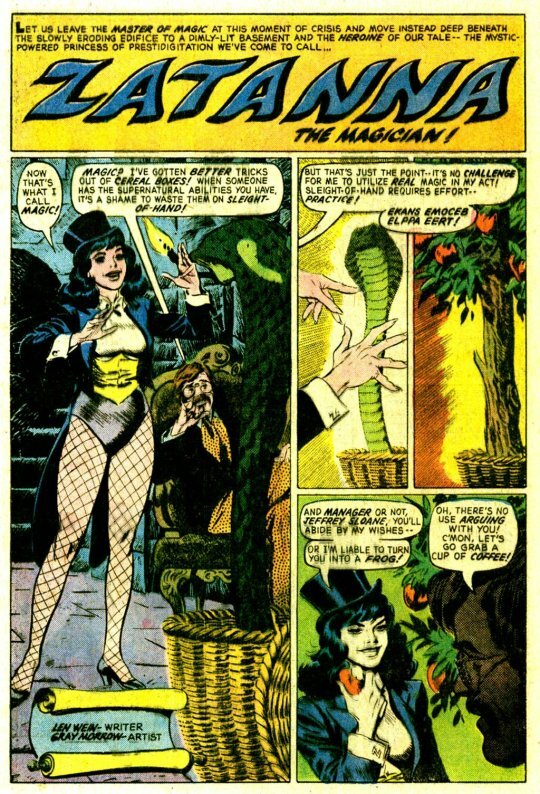 The story opens with Zatanna’s father Zatara being ensorceled by a mysterious foe, and in turn banishing Zatanna and her agent, the thoroughly-1970s Jeffrey Sloane, to a fantasy dimension. Unable to overcome the spell that sent them there, Zatanna and Jeff set off across the landscape, looking for a way back and battling wizards and monsters and barbarians along the way. Making their way back to Earth, the pair find Zatara terrorizing Times Square with is magic. Unable to defeat him in another way and in order to save Jeff’s life, Zatanna kills Zatara–or so it seems. This causes the spirit of Zatara’s old foe Allura to rise from his body–only for Zatanna to trap it in a bottle. And Zatara isn’t really dead, Zatanna simply used sleight-of-hand to inject him with a paralytic agent. And so, all’s well that ends well! 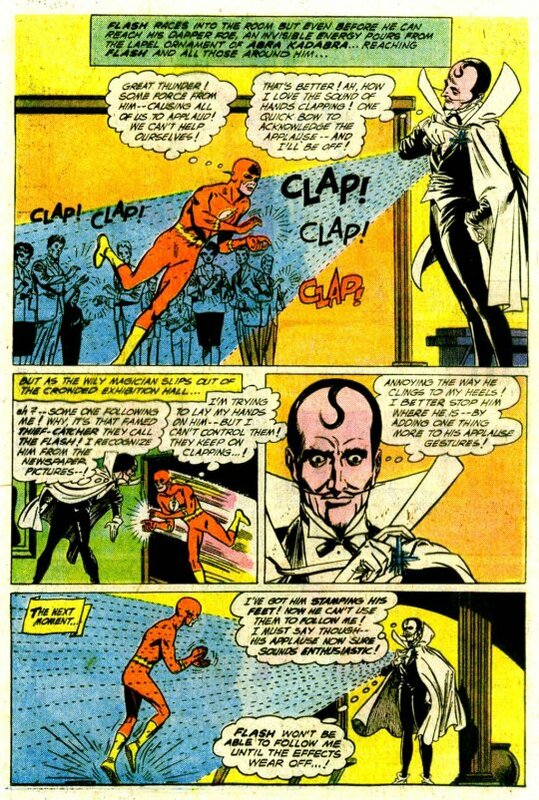 Following a feature on Houdini and another on magicians through the ages came a slightly-truncated reprint of the first appearance of Abra Kadabra, the 64-Century magician whom the Flash had seemingly just killed in his latest adventure. In this origin story, however, we learn that in the 64th Century, magic is something of a lost art as technology has advanced to the point where it’s superfluous. Driven by a mania to prove himself the greatest conjurer of all, Abra Kadabra steals a time machine to go back to the present, where his futuristic tricks appear to function like magic. But even so, Abra Kadabra can’t quite seem to get enough people to pay attention to him–and, more crucially for his mania, to applaud for him. 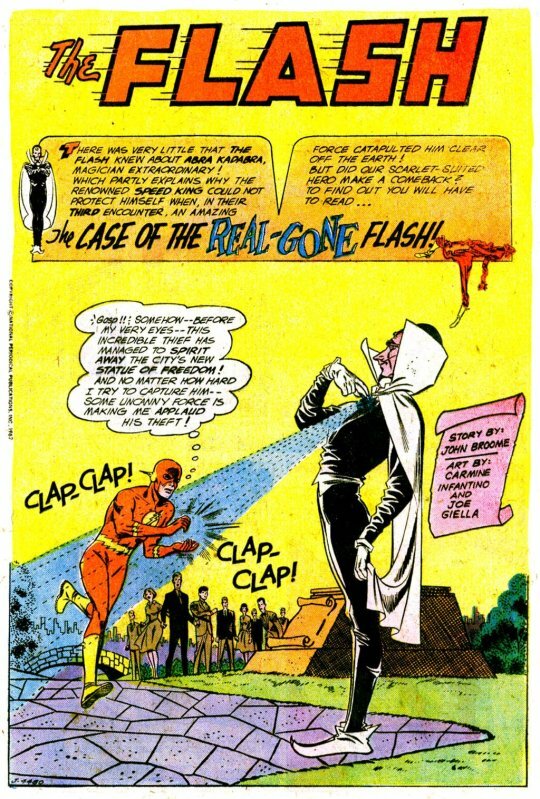 But noticing the amount of press that the Flash gets, he embarks on a series of colorful robberies, not because he has any interest in the items that he’s stealing, but entirely for publicity. He succeeds time and again, and even the Flash cant seem to lay a finger on him–but still there is no applause that he doesn’t force to happen. Abra needs to do something bigger, something more colorful, and so he rents out a hall and announces a free demonstration of his skills. 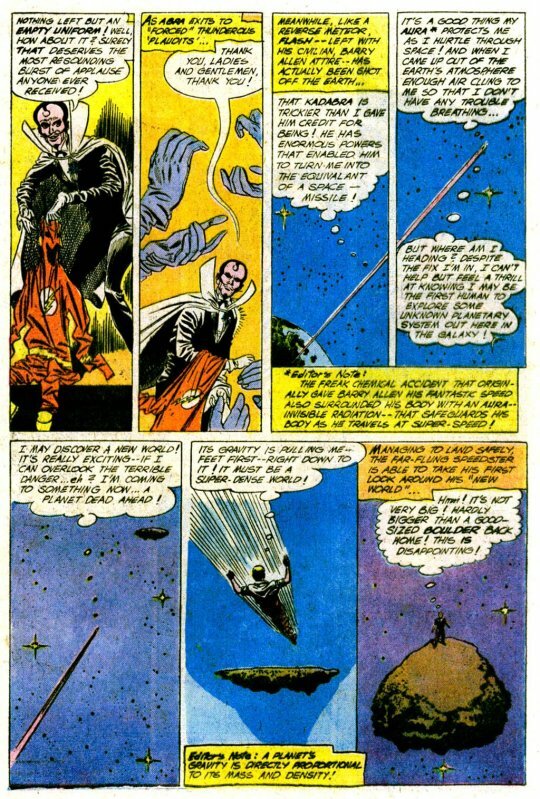 This draws the attention of the Flash, of course, whom Abra sends shooting off into space, blowing him right out of his costume. Fortunately for Barry Allen, his aura protects him somehow from the bitter cold and the void of space and enough atmosphere clings to him as he goes so that he’s in no immediate peril. Alighting on a super-dense asteroid, he promptly calculates a return route for himself, achieves escape velocity, and hurls ihmself back to Earth–where it’s a simple matter to run down Abra Kadabra and kayo the unsuspecting magician before he can bring another trick into play. But even while carting his new enemy to jail, Flash still has no idea of Abra’s place of origin or how he works his magic, which would be a running theme through their first few encounters. 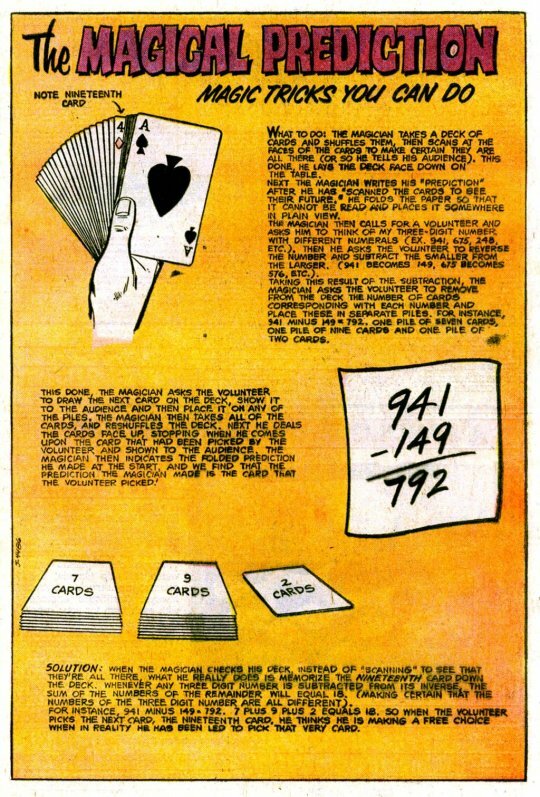 The issue closes out with a series of instructions for magic tricks that the reader can do at home. I dabbled around with magic as a kid, so these were all things I tried at one point or another. But I was never terribly good at it–I didn’t have the patience to perform the trick time after time after time until I’d perfected it.